Meet Fredericksburg Police Officer Shaun Jergens while the photo may look impressive the fact is you can put lipstick on a pig but its still a pig. No doubt Officer Shaun Jergens is a criminal, thug, bully and problem person who has no business with a badge, uniform of authority or deadly force. This is nothing more than a bad cop who is afraid of his shadow. 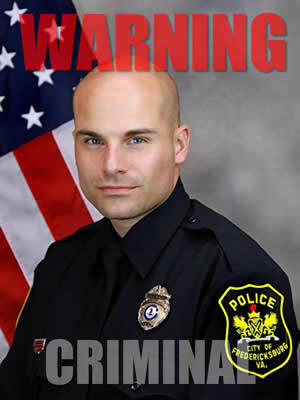 Its bad cops like this who abuse their power and attack innocent people. As we’ve all heard before the excuse then will be “I feared for my life”. There never was any danger. Virginia police officer Shaun Jergens resigned amid claims of excessive force when he used a Taser and pepper-sprayed a man who was suffering from a medical emergency, according to police accounts and newly released body cam video. Fredericksburg Police Officer Shaun Jergens stepped down May 14, 10 days after he confronted wrong-way driver David Washington, 34, in a suspected hit-and-run crash. The showdown took place earlier this month when Washington plowed through a city road sign, drove over a median and eventually struck another car before his Hyundai came to a stop in the middle of an intersection near the campus of the University of Mary Washington. Note how cowardly all the officers act at the scene, no gun, no crime. These officers are so afraid of their own shadows a man suffering from a heart attack almost dies from these buffoons and morons who walk around with badges and guns. Lets not forget the very unprofessional language. This is totally uncalled for and there is no excuse for the way this event unfolded. Now imagine the lies and scams they’d pull if they shot this man to death?